The 31st Annual Berkeley Juneteenth Festival is on Father’s Day, Sunday, June 17, 2018, from 11am to 7pm, on Alcatraz at Adeline in Berkeley. This year’s festival theme and image “Stand Up!”, is borrowed from a painting by California artist, Gerald O. Simpson, a depiction of former enslaved men ‘signing up and standing up’ to fight for their freedom during the civil war. 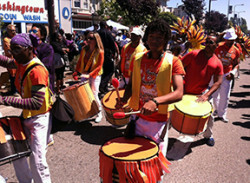 The annual Berkeley Juneteenth Festival has become an opportunity to enjoy the day, connect with old and new friends and celebrate african american history, heritage, and culture. The program will start at 11am with a “Ring Shout” presentation by Omnira Institute. Appearing on two stages: Rhonda Benin; Howard Wiley and Extra Nappy Band; We Are One; Sonny Fairley; Ronnie Mills; Ke’Shay Love; Kolamanjaro; Jax; William Varner; East Bay Warriors, Berkeley Black Ecumenical Ministerial Alliance, and more. Masters of Ceremony: Jay Rich; Doug Stewart; Jasmin Hudson; Aniya Williams; and DJ O’Aces. The Festival will offer a wide array of African goods, clothing, art, books, jewelry, health screenings, historical exhibits, community resources, and great food. Kids Zone activities include new attractions such as a a Zip-Line, Slime Bar; science activities by BAYER, slides and a bouncy house, and face painting by Ladybug Clown. Admission is free and open to the public. For easy access, festival-goers should exit BART-Ashby Station, walk south on MLK to Alcatraz Ave.